Lists, in general, help make sure that tasks and important activities are accomplished within the given time frame. 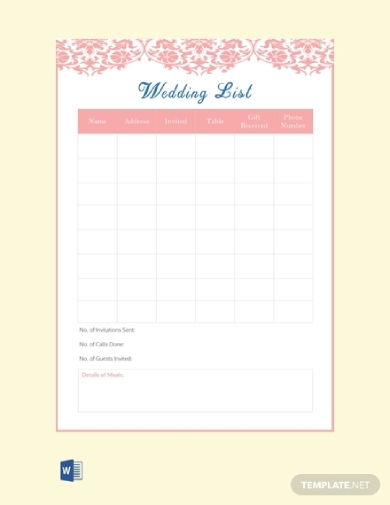 When planning for a wedding, it is especially important to make specific lists to help smoothly achieve specific goals. It is important to make sure that you include enough information, categories, aspects, etc. relevant to the purpose of your wedding list. As small a detail as it may seem, having lists specifically tailored to purposes or goals that you want to achieve during the wedding planning will help you record and track your progress. You can also use it as a reference point should any issue arise to help you make better and more efficient problem-solving decisions. In this article, various list templates and examples that you can use before, during, and after your wedding are provided. It is important to check whether or not the number of invited guests are the same as the number of guests present during the wedding since it can greatly affect your wedding budget. Having a wedding guest list you can refer to during or after the wedding day ensures that no unnecessary charges will be added to your bill by the venue and/or the caterer. The guest list should include the name of the guest, table number, invitation number (if applicable), and so on. 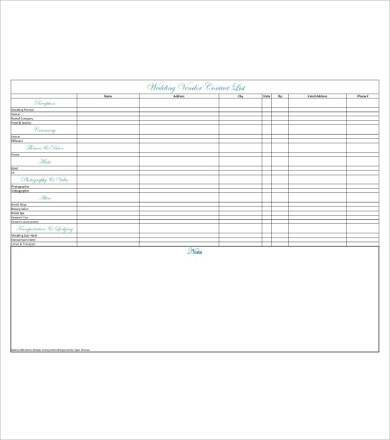 You can download this printable wedding guest list template to use for your wedding; it includes all the aspects and information that you may need for easy and efficient tracking, but you can still edit its contents to suit your theme or preference. The wedding industry is a tough business to dive into. You have to constantly compete for clients since you have a pretty small niche with quite a few numbers ofs competitors. With that said, having a price list for the products and services that you offer will help clients know if you are well within their range. 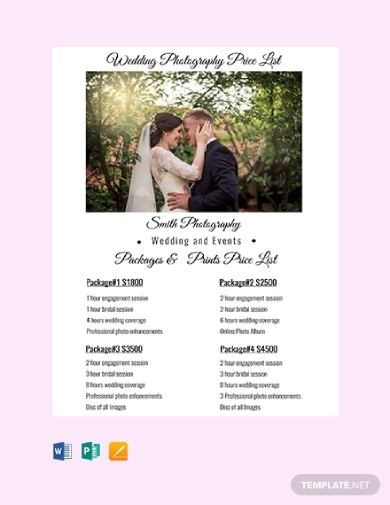 This wedding photography price list example has comprehensively presented various packages that the photographer offers. It has also included all the services include for each package to help clients better understand what they get for the amount that they pay for. A handy price list that completely presents all relevant and necessary information will help entice potential clients to choose you instead of other photographers. In certain traditions, it is normal for both the bride’s and the groom’s families to divide the expenses for the wedding. Thus, having a wedding expense list can help you and your partner to stay within your intended budget. It will also ensure that there is clear documentation as to what has already been paid and provided to avoid expensive duplication. 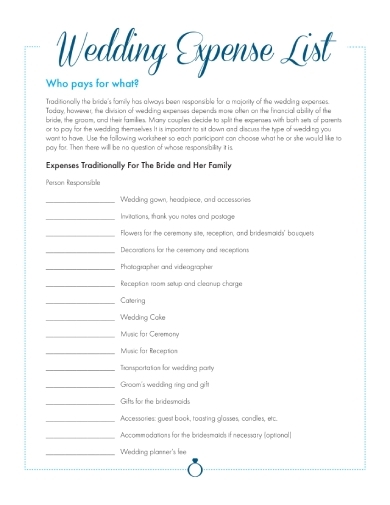 This wedding expense list example presents what expenses the bride’s family traditionally shoulders. It has accounted for all the things or aspects that should be taken care of along with who in the family is specifically responsible for what. This helps keep track and take into account each necessity that will help in ensuring all aspects are provided and accomplished before the wedding day. Your theme can only be realized with the use of theme-appropriate decors. This means that the decorations you use can either liven or dishearten the vibes of your wedding venue. Thus, it is important to ensure that the decorations you prefer are all set up in your wedding ceremony venue, reception venue, and so on. 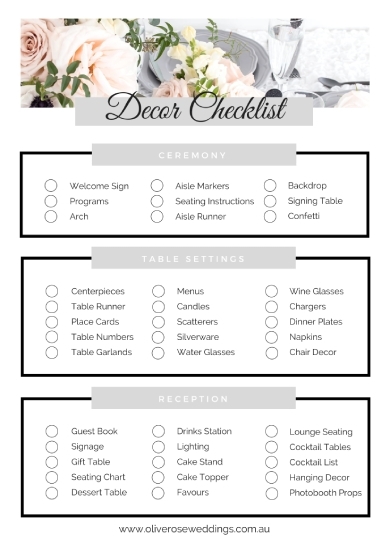 Having a list similar to this wedding checklist example can help ensure that all the decorations for each specific places are all set up to achieve the theme or vibes that you are going for. Since this is in a checklist format, you can easily check off the list of items that have already been set up. This will help you efficiently take into account the number of decorations and specific items you need to put in certain areas. Ensuring that you have a good relationship with your wedding vendors can help make your wedding day the best day ever. But aside from that, it is important to note their contact information to make it easier for you to get in touch with them should you have any inquiries, suggestions, etc. This wedding vendor contact list example shows how you can efficiently and comprehensively organize the vendor information for each category. In this example, categories that need various vendors are separated. This ensures that all important aspects of the overall wedding planning are included so that vendors for each necessity can also be included along with their contact information. You can take inspiration with how this was organized to help you make your own systematic wedding vendor contact list. Just like how a to-do list can help in everyday life, it can also help in your wedding planning. 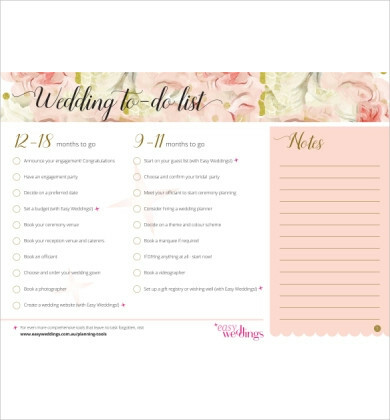 A comprehensive wedding to-do list, similar to this example, can help you maintain your focus a few months or weeks and even during the wedding day. As you can see in this example, it has accounted for the things that need to be done 12–18 months before the wedding as well as 9–11 months before the wedding. Going as far back as these months with your wedding preparation will help ensure that you have already accomplished some of the essential tasks to avoid being stressed out a few weeks before the day itself.